Democratic Republic of the Congo has had cases of polio caused by vaccine-derived polioviruses (VDPVs) documented since 2004. The emergence of these VDPVs, which cause paralysis similar to wild polioviruses, can occur where population immunity to poliovirus is suboptimal. Risk for VDPV emergence in DRC will remain unless population immunity to poliovirus is increased and maintained. Perhaps I should bet on Guinea worm as the best candidate for the next disease to be eradicated. Smart devices and mobile apps have the potential to reshape public health alerts and responses, health care industry analysts and researchers told The Bee. Over in San Francisco, for instance, the staff of smart thermometer maker Kinsa were receiving temperature readings that augured the surge of flu patients in emergency rooms there. The clashes between the Hema and Lendu communities — on the eastern side of the Ituri province, bordering Uganda — started in December and escalated in early February. Historically, these distant conflicts have been difficult to analyze. But new technologies allow us to investigate them in close to real time. I immediately collected active-fire data from NASA — thermal anomalies, or hot spots, that are recorded daily. It showed dozens of fires on the densely forested mountain ridge and along the shoreline of Lake Albert, one of the African Great Lakes between Congo and Uganda. Google and other online mapping platforms often show only blurry satellite images, or have no location names for remote areas such as the small fishing villages around Lake Albert. This makes it difficult to find places where people live. To deal with this challenge, I exported residential data from the online mapping site Openstreetmap. I then overlaid the NASA data with this new data in Google Earth to look for recorded fires that were in or near populated places. The author goes on to explain that they used this data in conjunction with traditional "shoe-leather reporting" to tell the story "in the most powerful and visual way." I have really appreciated that journalists have begun accompanying their reporting with pieces that explain their methodology in detail. One silver lining amid all the tempest over "fake news." 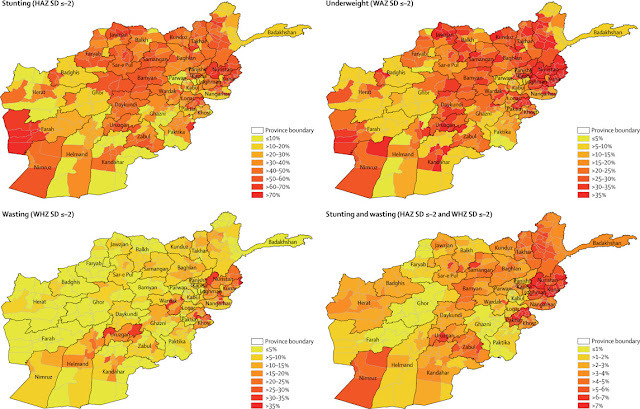 The 2013 Afghanistan NNS is the largest, most comprehensive nutrition assessment of its kind to be done in the country. 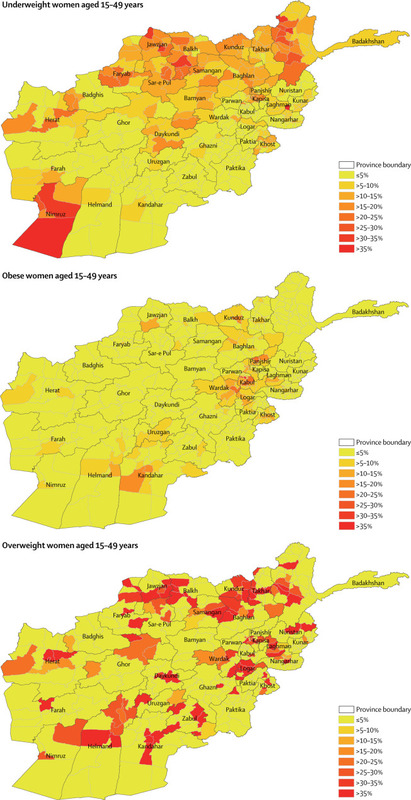 Designed to be representative at the national and provincial levels, the survey's aim was to provide estimates on various nutritional indicators, including anthropometry, infant and young child feeding, and micronutrient deficiencies, for women, children, adolescent girls, and the elderly in Afghanistan. The specific objectives of our study were to estimate the district-level prevalence of nutritional status indicators among children (stunting, underweight, or wasting) and women of reproductive age (underweight or short stature) and to understand the major causes of undernutrition in women and children in Afghanistan through exploring a range of individual, household, community, and environmental risk factors. Districts with alarmingly high wasting prevalence (some exceeded 20%) were in central regions and regions bordering Pakistan, including the east, southeast, and south. The concurrent conflict and insecurity in these regions could be one explanation, particularly since a gradient of child emaciation across wealth status and maternal education was not evident. De-identified, aggregate data were obtained from Source Healthcare Analytics, LLC (SHA) with the support of Gilead Sciences, Inc., and compiled by researchers at the Rollins School of Public Health at Emory University. SHA collects data from over 54,000 pharmacies, 1,500 hospitals, 800 outpatient facilities, and 80,000 physician practices across the U.S. SHA’s dataset contains prescription, medical, and hospital claims data for all payment types, including commercial plans, Medicare Part D, cash, assistance programs, and Medicaid. From this overall sample, AIDSVu presents a subset of data comprising prescriptions for TDF/FTC for PrEP. For the study, Teresa Seeman, an epidemiologist at UCLA, and her colleagues examined longitudinal data on 4,600 people between the ages of 45 and 84 collected between 2000 and 2012 to look for changes in their blood pressure and fasting blood-sugar levels. They found that blood pressure increased significantly among all groups during the time period, and blood glucose did too, among certain groups. The authors speculate the reason for the spike was stress—potentially different stressors for different generations. The younger people in the cohort were either unemployed, or those still working were likely wondering how on Earth they would be able to retire. The older people may have owned their own homes and watched the housing market collapse. All of this, they found, likely drove up their stress levels, and blood pressure. The authors also found that during the recession, many people stopped taking their medications—especially older homeowners, whose major sources of wealth were evaporating. “The evidence suggests that the stresses of the Great Recession took their greatest toll on those who are on medication,” they write—because they may not have been able to afford the drugs anymore. These findings further confirm what other researchers have seen on a more cellular level: Economic hardship causes stress, and that stress can sneak under the skin, disrupting bodily systems. The author takes a dig at economist Tyler Cowen, too, which was kind of fun. The N.R.A. pushed Congress in 1995 to stop the C.D.C. from spending taxpayer money on research that advocated gun control. Congress then passed the Dickey Amendment in 1996, and cut funding that effectively ended the C.D.C.’s study of gun violence as a public health issue. There is much ink to be spilled on the question of why the NRA and other conservatives feel that research on gun violence "advocates" for gun control - probably along the lines of the confirmation bias phenomenon and how people react when presented with evidence that challenges their cherished beliefs. Methodologically sound research does not "advocate" for anything. But I will leave that to more eloquent commentators. In the meantime, AJPH is working to bridge the research gap by making all of its published work on gun violence open access (it's typically behind a paywall). No. 1 we want America to understand this is a problem. And I'm an avid NPR listener, so I can speak from that point of view and tell you that a lot of your listeners may not believe that America doesn't see this as a problem. But the majority of the public does not see the opioid epidemic as rising to the level of an emergency. So it's important that we continue to say at the highest levels this is a problem in all communities, and it's getting worse. From July 2016 through September 2017, a total of 142,557 ED visits (15.7 per 10,000 visits) from 52 jurisdictions in 45 states were suspected opioid-involved overdoses. This rate increased on average by 5.6% per quarter. Rates increased across demographic groups and all five U.S. regions, with largest increases in the Southwest, Midwest, and West (approximately 7%–11% per quarter). In 16 states, 119,198 ED visits (26.7 per 10,000 visits) were suspected opioid-involved overdoses. Ten states (Delaware, Illinois, Indiana, Maine, Missouri, Nevada, North Carolina, Ohio, Pennsylvania, and Wisconsin) experienced significant quarterly rate increases from third quarter 2016 to third quarter 2017, and in one state (Kentucky), rates decreased significantly. The highest rate increases occurred in large central metropolitan areas. More brain scans. Last year, the Stanford Center for Reproducible Neuroscience launched OpenNeuro, “a free and open platform for analyzing and sharing neuroimaging data.” (It’s the successor to the center’s earlier initiative, OpenfMRI.) You can, for instance, download scans of brains that were watching a particular episode of The Twilight Zone. Related: The Brain Imaging Data Structure, “a simple and intuitive way to organize and describe your neuroimaging and behavioral data.” Previously: The Open Access Series of Imaging Studies (DIP 2017.08.16). Powerlifting. OpenPowerlifting.org “aims to create a permanent, accurate, convenient, accessible, open archive of the world's powerlifting data. In support of this mission, all of the OpenPowerlifting data and code is available for download in useful formats.” So far, that includes 400,000+ performances at 9,000+ competitions in dozens of countries. This week's Data is Plural newsletter features two data sets that are of interest to those who work on health in conflict zones, as well as one on the EPA's radiation monitoring system. Peace agreements. 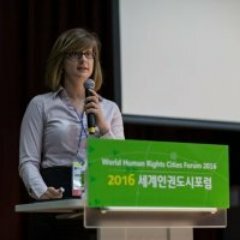 The PA-X Peace Agreements Database contains structured information about 1,500+ “formal, publicly-available documents” that address “conflict with a view to ending it.” The database covers more than 140 peace processes between 1990 and 2015, and each agreement has been coded for more than 200 variables — for instance, whether the agreement contains provisions about religious groups. Historical battles. Political scientist Jeffrey Arnold has converted the U.S. Army Concepts Analysis Agency (CAA) Database of Battles from a series of Lotus 1-2-3 worksheets into tidier, easier-to-use CSV files. The dataset includes details of 660 battles — associated with several dozen wars — between 1600 and the mid/late-1900s. The fields indicate each battle’s “name, date, and location; the strengths and losses on each side; identification of the victor; temporal duration of the battle,” and more. American radiation. The Environmental Protection Agency’s RadNet system“monitors the nation's air, precipitation and drinking water for radiation.” The radiation measurements, collected from 130+ stations in all 50 states plus the District of Columbia and Puerto Rico, are available on a “near-real-time” basis. Related: Randall Munroe’s radiation dose chart. Previously: SafeCast (DIP 2016.02.03).